It must have been the first time that three people ever stood around a beehive and said “American Foul Brood. Great!” No, we’re not mad, nor gluttons for punishment. Professor Penny Amy, a microbiologist, and researcher Diane Yost, an environmental microbiology student (both of University of Nevada, Los Vegas), and I, the beekeeper of the sadly afflicted hive, were about to test rehydradted phages that will hopefully kill the bacteria that cause AFB. The images in this blog are from two different treatments. Some are from when Penny and Diane were here; some are from the most recent treatment, which I did just the other day. I “met” Penny and Diane while doing a search for anyone in the world who was doing work on for my blog post about AFB research. What I found was that there is almost no work being done! One fellow in Denmark has retired. I couldn’t contact a German researcher. This left a UK program about how AFB is distributed and the vital research being conducted by Penny and Diane. They are working to isolate phages that specifically target and kill AFB bacteria and find a means of delivering these phages to infected (and potentially infected) honeybee colonies. (Phages are virus that attack and kill bacteria). They are currently in the testing stage – early days, but promising. Again, the above link has more information on their work. I had two hives that had been tested by the USDA Bee Lab in Maryland and had come back positive for American Foul Brood. At the University of Nevada, Los Vegas, Penny and Diane had isolated phages that attack AFB – in the lab. Diane had discovered a way to freeze-dry them (there is a real fancy word for this, but, alas, I forgot it); then restore them to fighting strength. Some of these phages came from a sample I sent, others came from beekeepers throughout the US and in Europe. These phages were in their kit. I made up some cane sugar syrup (about 1.5 sugar to 1 water, I think). I didn’t weigh or measure my syrup contents, so a sample of this syrup went back with Penny and Diane to be analyzed. I did use “city of Glacier” water, rather than the rain capture water I usually use, because I figured the city water would be free of maple and cedar oils. 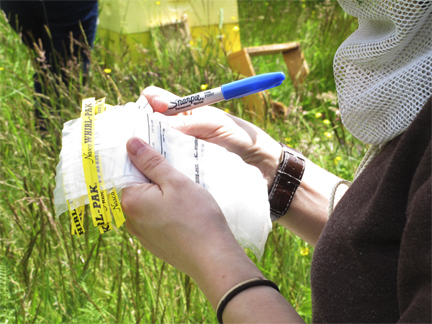 At the hives, Penny and Diane rehydrated the phages in the test tubes that housed the phages. My syrup was used to rehydrate the phages, but it was later decided that this stage was best done with store-bought water (that old “what’s in the water” question around here). Indeed, the water worked well during the most recent treatment. 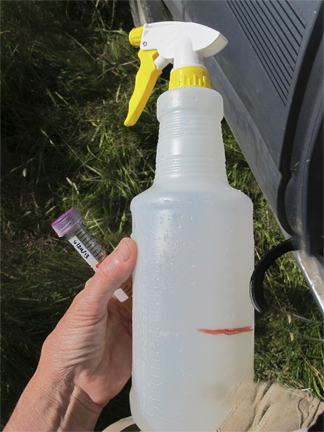 The rehydrated phages were then added to 400 milliliters my syrup in a spray bottle. 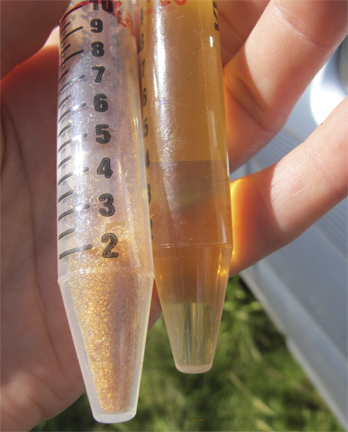 This mix was sprayed onto the bees working the infected comb and onto the comb itself. One hive would be the “Control” hive: just syrup, applied in the same manner as the treatment, but with no phages. A second hive would be the “Treated” hive (they have a better word, I’m sure, but this is an AFB hive that gets phage/syrup mix). A third, AFB-free hive, would also be “Treated”. This hive is called the Non-Infected Hive, but I think of it as the “Karen is overjoyed to have these phages in yet another one of her bee yards” hive. Each of the three hives is in a separate location, each separated by over 4 miles. At each step, photos, notes and samples were taken. 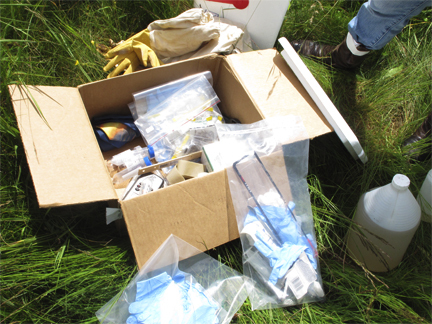 Samples included soil, beeswax, royal jelly, and anything that looked interesting. Frames were numbered. Box numbers noted. Words like rehydrate are mine – I’m sure both Penny and Diane would have a much better term. Spraying on brood versus feeding: The idea is to get the nurse bees to eat the phage/syrup mix and then deliver it to the larvae. If it were fall, I think it could be put in the feed. But during a good honey flow the bees would rather eat honey than syrup. Thus direct spray was the final decision. The first hive we went to showed no visible signs of AFB. I felt bad! There was an intense honey flow near that hive when we were there. Blackberries and clover were in abundance. If I didn’t know the test had shown positive for AFB, I would not have believed the hive was infected. It was picture perfect brood. 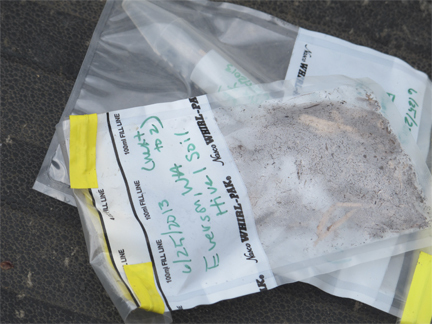 Diane later tested a sample from this hive and AFB doesn’t show! Yet it tested positive before, and had been slated for killing/burning/scorching. I still think AFB will show up again. Control frame, looking too good. American Foul Brood seems to rear its ugly head in times of low forage, be that a dearth, or the fall and winter, here. I think it’s a combination of bees getting stressed, while consuming every last bit of food, some of which might have AFB – which the bees then pass on to their young. This first hive was chosen to be the “Control” hive. Penny said that this worked out well. As they wanted the first hive we visited to be the “Control” (no phages, just syrup), and the second hive to be the “Treated” hive. By doing the “Control” first, we would not carry phages, on our equipment or ourselves, to the control hive. Had phages contacted the “Control”, it would no longer be a control. The second hive was the “American Foul Brood. Great!” hive. This sad little hive had shown a few AFB cells when I had checked it about a week before. I was worried then that there wasn’t enough AFB to conduct a decent Field Test. I need not have worried. The AFB had spread. 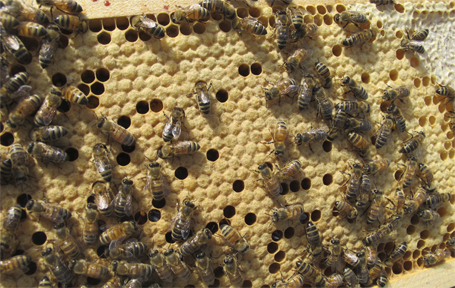 The hive was sprayed in the same manner as the first hive. The above picture was taken just before the most recent phage treatment. Two weeks before the entire frame was covered in AFB affected cells. Now eggs and larvae can be seen amid the AFB – we’ll see what happens with those young in two weeks (the next treatment). 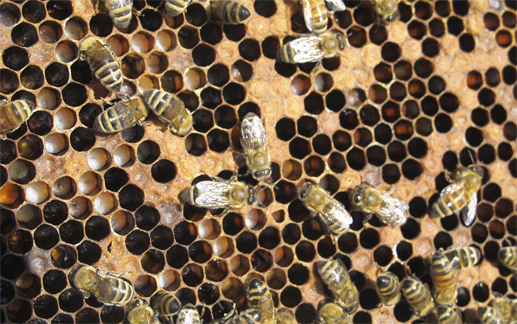 This hive was treated and photographed in the same manner as the Control and Treatment hives. I get to continue treating the second and third hive, and spraying the first, control, hive with sugar syrup. I’m pretty excited about this. What could be better (other than not having AFB)? I love science. I love to experiment. And I think if this phage treatment works it will be one of the best things to hit beekeeping in a long, long time. It is early days. But I’m going to hope, while Penny and Diane do all the work. It would be wonderful if we could drag AFB treatment out of the 19th century and into the 21th century. 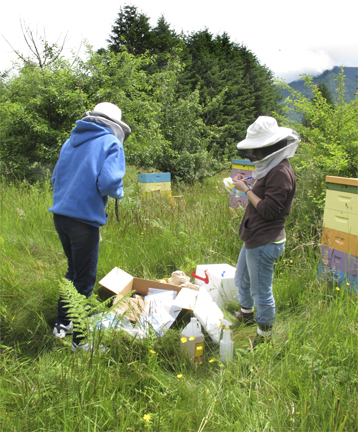 What’s happening in your bee yards? The heat here is amazing – after heavy rains last week. The weather’s just going to keep us guessing. This entry was posted in Beekeeping, Diseases and Pests and tagged AFB, American Foul Brood, bacteriophages, Brookfield Farm, disease, field test, Maple Falls, phage, phages, treatment, Washington. Bookmark the permalink.